Today is my husband’s birthday, so he got to plan his own birthday dinner. He chose staying home and he chose the menu. Having lived for decades on the Outer Banks, he loves seafood. I am from California, so I also love seafood. This is a super simple recipe that gets a sophisticated flare from white wine, a richness from cream, and an out-and-out decadence from pan seared scallops. This would go well over angel hair pasta or even rice. The sauce would be delicious with a crusty bread and a high quality butter. You really can’t go wrong here. In a large sauté pan, heat 1/4 cup olive oil over medium heat. Add shallots and sauté until tender and translucent. Add wine to the pan to deglaze, followed by parsley, basil and thyme. Simmer until the liquid has reduced by half. Strain the reduction into a clean saucepan and add the cream. Allow the sauce to simmer over low heat until it has reduced to medium thickness. Pat the shellfish dry thoroughly with paper towels and then salt and pepper them on both sides. Heat remaining 2 tablespoons of olive oil in a large pan over medium high heat. 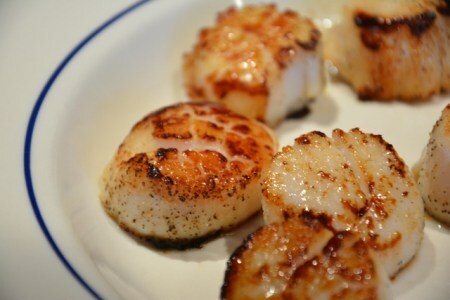 Add the scallops to the pan and let them sear for 3 minutes per side. They should have a nice, brown crust on them when you turn them. 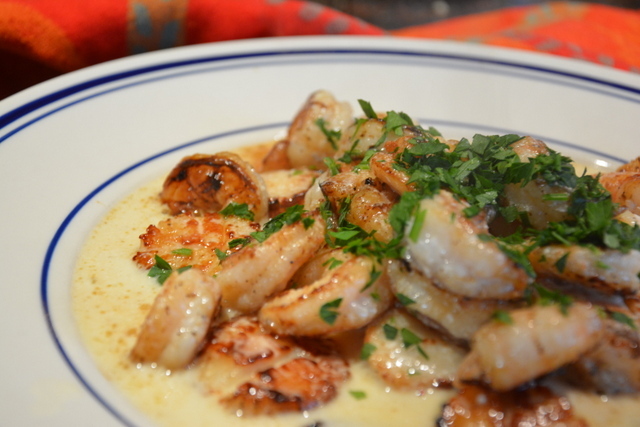 Transfer the seared scallops to a warm plate and sear the shrimp. The shrimp will take less time, about 2 minutes per side. Arrange the shellfish on a serving dish or on a bed of pasta, and spoon sauce over. Garnish with parsley and serve with a high quality shredded parmesan.